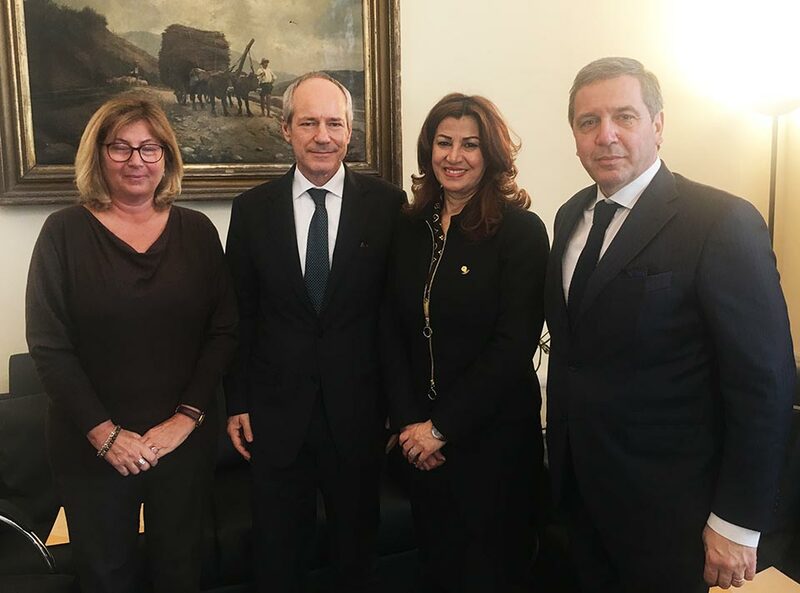 Today, Mrs. Kader, accompanied by Prof. Valter Cantino, Director of the Department of Management of the University of Turin, met with Min. Pl. Iacoangeli, Diplomatic Advisor to the Minister of Education, Valeria Fedeli. Mrs. Kader, thanking for His kind hospitality, explained to Min. Pl. Iacoangeli the current situation in the Kurdistan Region, the fight against ISIS and the ongoing humanitarian emergency. The priority of the Kurdistan Regional Government is to restore a climate of mutual trust, protecting the ethnic-religious integration that has always characterized the Region and to guarantee peace and stability. Reconstruction must necessarily start from the education and training of young people, a goal that we want to achieve with the contribution of Italian know-how, an excellency in the field. In this regard, Prof. Cantino illustrated to the Min. Pl. Iacoangeli the ambitious project aimed at developing with the Regional Government of Kurdistan, but also with the support of the Italian Ministry of Education, a "Joint Campus" to promote integration but also to form the entrepreneurial and managerial class of the future, thanks to the contribution of academics and the Italian entrepreneurial system. Mrs. Kader concluded emphasizing the importance of the project, which, by investing in young people, will also provide them better life prospects and job opportunities on the spot, reducing the migratory thrust abroad. Min. Iacoangeli welcomed the project also on behalf of Minister Fedeli, underlining that it would be followed by the departments responsible for its implementation.